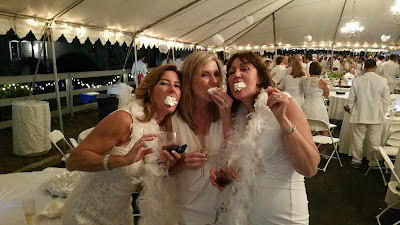 You know the most interesting thing about Vienna, Virginia’s, first Diner en Blanc? No matter what color the attendees were wearing, it would still have been the whitest event around. Our friend who bought tickets for the event was so enthusiastic about getting them when they went on sale that she scored us the #1 table. SO good for the self esteem. receive from this insanely popular blog will make up for our trespasses. Just like on my wedding day - only with fewer strippers. At the end of the evening, we walked around to the other tables and bartered cookies for wine. And Redi-Whip. This might be why my daughter is looking to emancipate herself. Justifiably. We had two silver candelabras as part of our table decor, though we were told we could not light them due to the Vienna fire code. We chose to abide by this intermittently, lighting the candles for every photo we took – including the one that made it to the front page of the Vienna Patch. Is it wrong that our goal was to get our photos in all the local media? What wine descriptors would you use to characterize yourself?